Mambazha Pulissery is one of the Traditional curries of Kerala prepared for Sadhya (festive recipes). 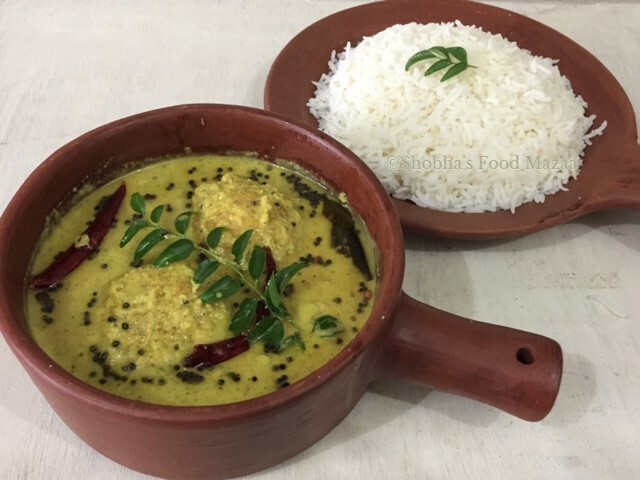 It is sweet, sour and spicy in flavour with coconut based gravy with the addition of yogurt and green chillies.This curry is usually paired with idiyappam but it goes well with plain rice, neer dosas and appams also. Pulissery and Moru Kootan have the similar gravy base. 1. Wash and peel the mangoes. 2. In a chatti or a pan take sufficient water and cook the mangoes adding slit green chillies, turmeric and salt. 3. Meanwhile grind the coconut , yogurt and cumin seeds to a paste. 4. Stir in the ground paste with the mangoes in the pan. 5. Mix carefully and check the salt. 6. When the curry is done remove it from the gas. 7. In a small pan heat the coconut oil ar any cooking oil. When it is hot reduce the flame and add the mustard seeds, fenugreek seeds, curry leaves and dry red chillies. 8. Stir in the tadka to the mango curry. We Gujaratis also prepare mango sabji which is sweet and sour. I would love to try the above dish as its got coconut. Do try this one since you like coconut.I have tried the Gujarati mango kadhi. My mother would make often and i loved it. This looks absolutely delicious!! Love the taste of it and this looks super delicious.